Investing in high-quality matching containers for staples in your pantry is both aesthetically pleasing and creates order. Brand packaging is bulky. Instead, use sleek plastic materials or traditional glass jars to house items like baking supplies, pasta or cereal. Once these are placed in their respective containers and labeled, you will find it easier to put them back exactly where they were before. Oftentimes these containers will save you precious shelf space as well. Whatever your personal style, it’s important to relocate all items into reusable canisters. We believe that everything in a pantry should have a proper home because that’s where organization starts. We offer built-in and removable metal baskets that can be used to store loose items in a pantry. They can even be hidden in cabinets or drawers to disguise clutter. These cabinets are perfect for storing linens, fruit or kid’s snacks. Because they pull out so easily, they’re perfect for on-the-go snacking or grabbing that after school snack before the kids head to soccer practice. Wine connoisseurs love being able to showcase their wine collections, but it’s often difficult to store a large collection of wine bottles properly. Our wine racks are customized to fit into our shelves and allow bottles to lay flat. You can quickly see labels and find the perfect selection to go with dinner or pre-party appetizers. The scalloped wine racks can even hold your most uniquely shaped bottles without slipping out of place, and they’re a breeze to put in and take out. We know that as a family grows, so do their needs – especially in the kitchen! Adjustable shelving comes standard in all pantries designed and installed by Boston Closet Company. Whether you have hungry teenagers that eat nonstop or you simply have a new stand mixer that doesn’t fit on the counter, it’s important to have room to grow. Our adjustable shelves are easy to move and don’t require any added construction. Our custom cabinets can be installed to match the rest of your kitchen and create even more storage space in your pantry. No matter your reason for storage, families know how important it is to stay organized in the kitchen. 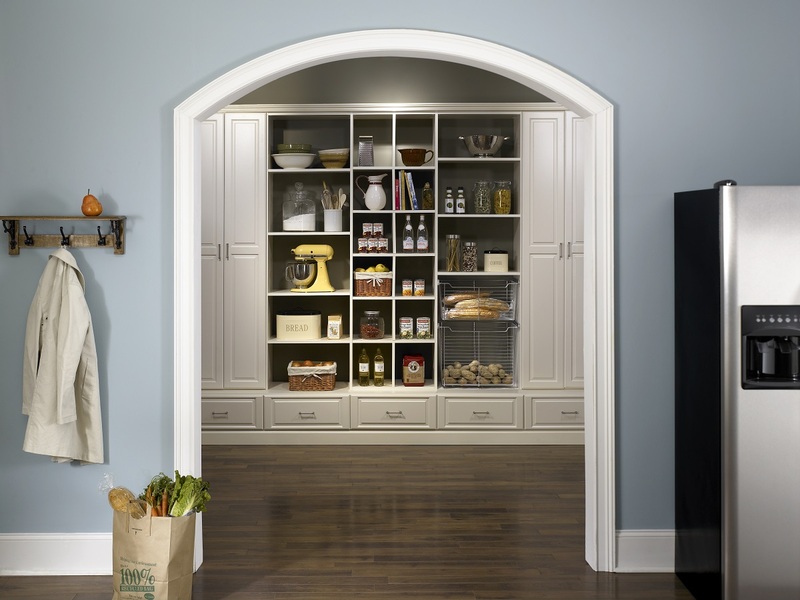 Boston Closet Company specializes in custom pantry design and will work with you to create the custom kitchen pantry of your dreams. Contact us to request your free design consultation today!